"Mom... can you make that to go?" This request seems to come more and more often as teenage schedules become busier and busier. Hence, finding a quick fuel "to go", or one that can easily be eaten on the run, ranks high in my menu plan. Enter the smoothie. Filled with vitamin rich fruits and/or veggies, our versions frequently add yogurt for a protein plus bone-building calcium boost as well as all sorts of add-ins including wheat germ, flax meal, protein powder and nuts. Loving those thick, smooth concoctions we find at the local smoothie store, I've spent the better part of 15 years searching for a powerful blender that won't break the bank or simply just break. Over the years, blender after blender has raised my hopes only to dash those same hopes when my frozen smoothie ingredients bring the blender motor to a grinding stop complete with yucky electrical aromas. 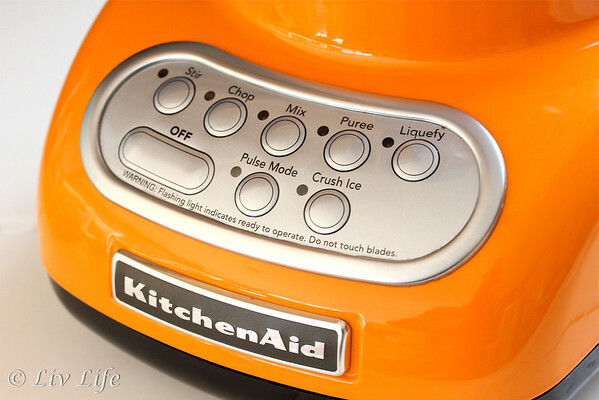 Enter Sandy, the KitchenAid Dream Blender. Well, to be exact her professional title is the "KitchenAid 5-Speed Blender with BPA-Free Pitcher", but Liv prefers to call ours "Sandy". I'm not sure why our Tangerine colored blender received the name Sandy, but Liv now asks, "Mom... would you have Sandy whip me up a smoothie please?" Though my ever growing smoothie repertoire includes a rainbow of variations (another recipe coming in our next post), the family favorite always returns to this original version of the first smoothie I ever made. 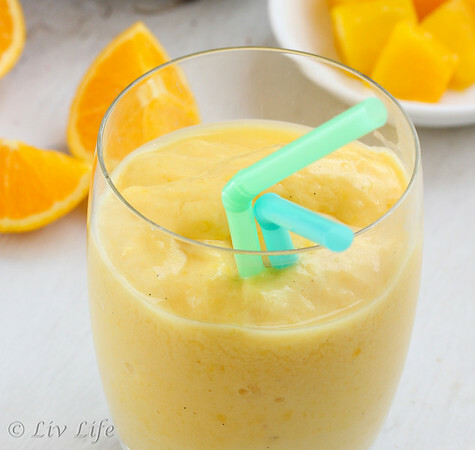 A few basic ingredients made even more handy with the seasonal oranges off of our backyard tree, the Orange Mango Sunshine Smoothie packs a powerful Vitamin C punch. 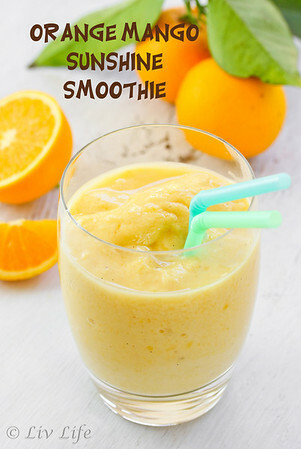 Topped off with a small carton of vanilla bean yogurt, a handful of frozen mango chunks and half of a frozen banana, this smoothie simply oozes sunshine in every sip. And with Sandy on the job, blending our sunny frozen concoction is as simple as pushing one of the blender's easy to clean buttons. Over the last few weeks we've put this blender to the test pureeing soups, mixing salad dressings, blending the perfect frozen margarita, and whipping up numerous thick, frozen smoothies. Not once has the motor groaned in protest or given off an overworked electrical smell. Not once has the blade ground to a halt, and not once have we had a chunky smoothie that doesn't flow through a straw. It may have taken 15 years, but I've finally found a blender that works and won't empty your wallet in the process. Thanks KitchenAid for suggesting the perfect blender for my kitchen and for sending Sandy to our home. Vitamin C-rich whole oranges blend beautifully with mineral filled mangoes to bring a bit of sunshine into your day. 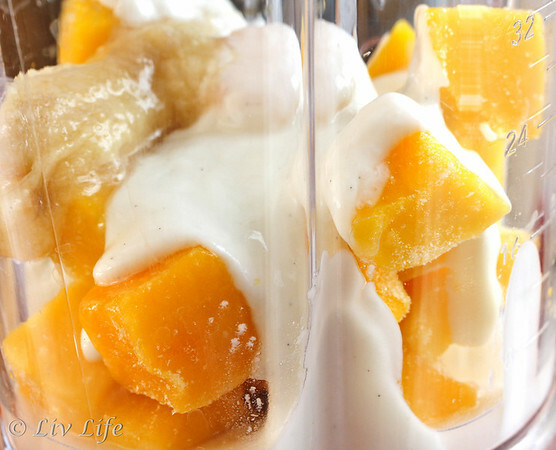 Vanilla bean yogurt adds a nice, creamy finish. Place all ingredients into your blender and blend until smooth, adding a few tablespoons of water or juice if the smoothie becomes too thick. Enjoy! Liv Life Note: I got tired of squeezing our oranges every day and one day just dropped the whole orange into the blender. Keeping the orange whole adds fiber to the mix, but if you only have orange juice on hand substitute a little over a cup of OJ in place of the whole oranges. Note, we received a blender from KitchenAid for our review ~ all comments and opinions are my own. This looks wonderful and I just happen to have everything on hand! Thanks! Bravo to you, Liv, Sandy and Kitchenaid! Dudette adores smoothies too, though I don't know what she'd think of mango. I usually go with mixed berries instead. Of course, my juice is from a carton since we don't have a handy tree in the yard :P but it works. So very sunshiny!! I feel like I haven't seen the sunshine in days!!! Looks awesome Kim, thanks for sharing! This looks like sunshine in a glass! You have me wanting to upgrade my blender--love that Liv named yours Sandy. This looks so amazingly refreshing! 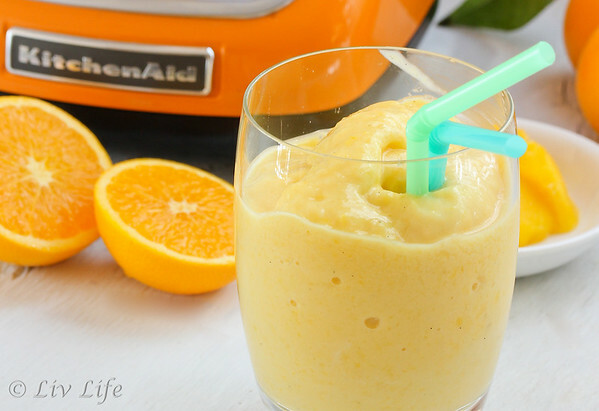 It's like summer in a glass...much-needed right now as we desperately need sunshine!